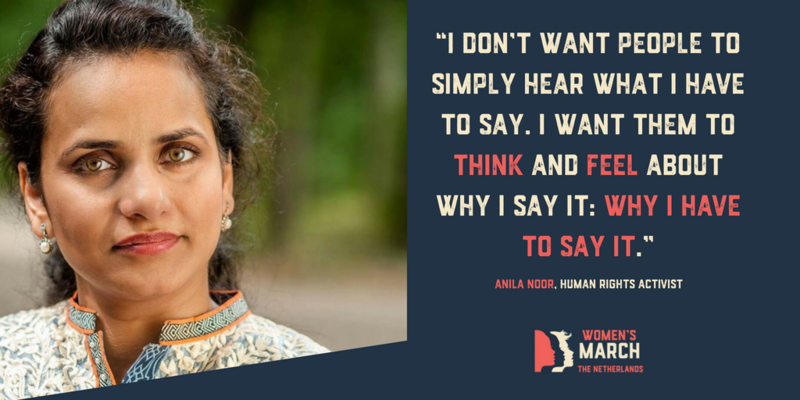 In an interview for womensmarch.nl, Anila Noor shares her personal journey from Pakistan to Europe, her views on feminism and work with minority communities. Anila Noor is a human rights activist and an independent researcher based in the Netherlands since 2013. Currently, she works on the subject of Receiving Refugees in Urban Settings in the Netherlands. Find out more about Anila. Anila is also a member of the European Migrant Advisory Board (EMAB), which advises the Urban Agenda for the EU Partnership on the Inclusion of Migrants and Refugees. The Board is a self-led group of advisors with refugee and immigrant backgrounds, working together to increase the participation of refugees and immigrants in different policy-making processes affecting their access to rights.